THE BEN HECHT SHOW takes you to 1943 into the private study of legendary playwright/screenwriter Ben Hecht (The Front Page, Nothing Sacred, Gone With The Wind). Hecht relates his own upbringing as an assimilated American Jew and his successes as a newspaperman, playwright, and screenwriter in Chicago, New York, and Hollywood. In the midst of the Second World War, Hecht becomes aware of the Nazi holocaust. 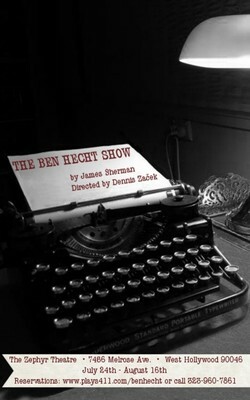 He tackles the realities of anti-Semitism and undertakes his own actions to affirm his connection to Judaism.Not-quite-as-legendary playwright/actor James Sherman (Beau Jest, The God of Isaac, Jacob and Jack) portrays Ben Hecht in this entertaining, thought-provoking, and (sadly) topical show.